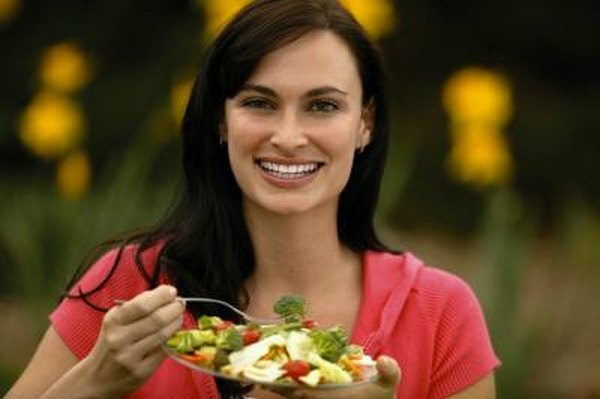 To maintain a healthy weight, your body relies on a healthy mix of a nutritious lower-calorie diet and exercise. However, there are a wide range of factors that determine how many calories your body needs to maintain or lose weight including your activity level, current weight, gender and age. This means that an 1,800 calorie diet may be right for one person, but could cause weight loss or, less commonly, weight gain in another. Before determining how many calories can cause you to gain weight, it's important to understand in what circumstances calories make you fat. Fat is stored when you have a calorie surplus in your body. A calorie surplus occurs when you consume more calories than you burn through basic bodily functions like breathing, plus calories burned from physical activities like exercise. When your body has a surplus of 3,500 calories throughout the week, you have the potential for gaining a lb. of body fat. To determine how many calories you can eat without gaining weight, you first have to understand your basal metabolic rate, or BMR. This rate is how many calories your body burns at rest with basic body functions. To calculate your BMR you can either use an online BMR calculator, or you can use the following equation. If your BMR is greater than 1800, which in most cases is probably true, then living off an 1,800 calorie diet will probably not make you fat. If your BMR is less than 1,800 but you exercise enough to bring your total calories burned above that amount, then you are also probably safe from weight gain. If you still gain weight, there may be an underlying medical condition, such as hypothyroidism or polycystic ovary syndrome, in which case you should see your doctor for appropriate treatment. In some cases, 1,800 calories may actually be too few calories for your daily diet. When you consume too few calories you can negatively impact your metabolism, as well as can rob your body of the essential nutrients it needs to function properly. Talk to your doctor or a registered dietitian about your specific calories needs to find a balanced calorie goal that will allow you to lose weight, or maintain a healthy weight, without risks to your health.